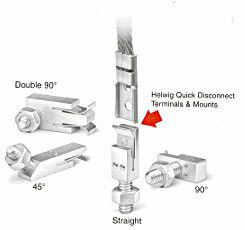 Source: Helwig Carbon Products, Inc.
Changing carbon brushes is a "snap" with Helwig Quick Disconnect (HQD) Terminals and Mounts. In fact, with Helwig HQD's you might finish a brush change in less time than it takes to find a screwdriver. Once the HQD Mounts are installed, HQD Terminals take just seconds to change - there are no screws to remove or replace. Simply pull the HQD Terminal off of the Mount to release the worn brush, and push on the HQD Terminal attached to the new brush. You'll save literally hours on your brush changes. HQD Terminals and Mounts snap together with a positive locking action that guarantees a safe, sure electrical connection tested at over 200A. HQD's have been field proven for over 25 years. Their tight, positive connections hold fast and keep right on working under some of the roughest conditions imaginable - rugged, real-world applications that could cause standard connections to work loose and fail. And, HQD's are as fast and easy to order as they are to change. HQD Mounts can be threaded to fit most existing units and/or brush holders. Many standard sizes can be delivered right from stock. All we need to know is the style and thread size. So call or write to us today with your requirements, and start enjoying the convenience of Helwig Quick Disconnect (HQD) Terminals & Mounts field tested timesavers that will help you get top performance from your motors and generators. Straight, 45 deg., 90 deg., Double 45 deg., Double 90 deg., Double Straight. Helwig Carbon Products, Inc., 8900 West Tower Ave., PO Box 240160, Milwaukee, WI 53224-2849. Tel: 414-354-2411; Fax: 414-354-2421.